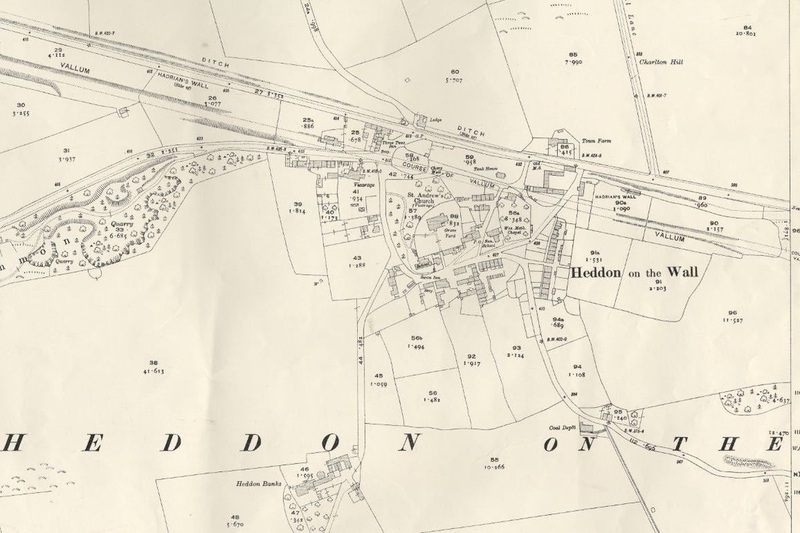 This is a section of the first edition Ordnance Survey map and shows Heddon-on-the-Wall in greater detail. The scale of the map is 25 inches to one mile, and it was published in the early 1860s. It shows the line of Hadrian's Wall and the Vallum running through the village. The road layout to the north of the village is quite different today, broadly following the line of the Wall forming a more or less straight line from WNW to ESE. The road junction just east of the Three Tuns leads to the Hexham Road. Two roads lead off to the north. One opposite the Three Tuns, as it is today but without the Lodge House, leads to the old Bays Leap Farm, which was much further north than the current farm of that name. Another road on the east side leads over Charlton Hill to Heddon Mill, and what is now Mill Lane, a layout changed with the building of the A69 by-pass and its access road to the north. Note the village pond (now the Memorial Park) opposite the Three Tuns. The Inn is shown with its adjoining smithy, just three houses adjacent along the Military Road, and a little square of cottages to its west. The Church is shown as dedicated to 'St Philip and St James' rather than St Andrew. The 'National School' is named to its south. The large Crag Field south of Heddon Quarries in the west is now a housing estate, as now are the fields east of the village. 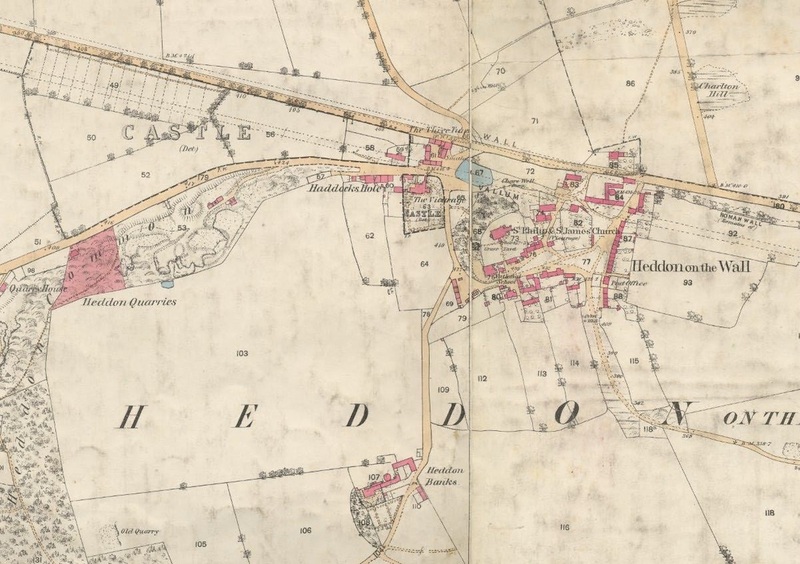 The name, 'Haddock's Hole' appears to refer to the area of the village west of the Vicarage on the south side of Hexham Road. Locals associate the name with old cottages formerly next to the Three Tuns. 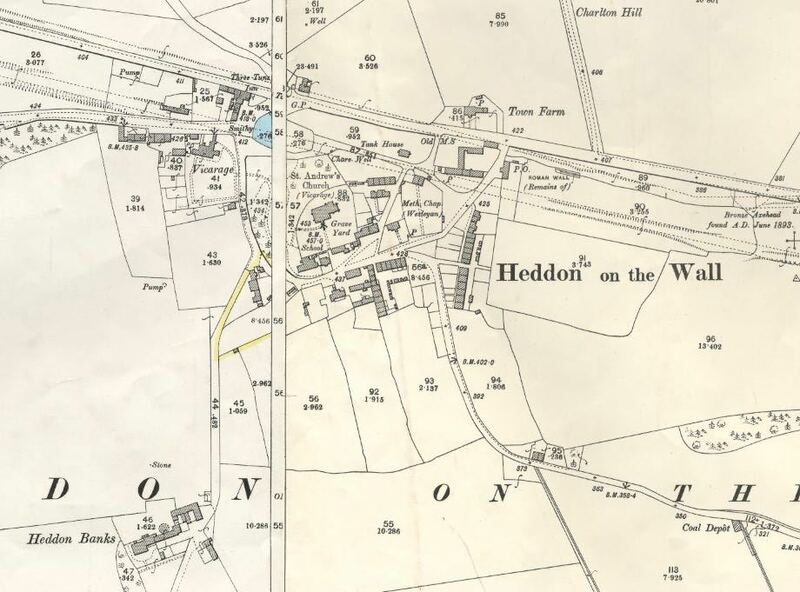 The 6 inch to 1 mile sheet of c1860 shows place names of Hassock and Hassockbog near Heddon House to the north-west which may be related. There is only a single property on the north side of Hexham Road road here, within the Glebe Lands. Quarry House and former cottages to its east are shown adjacent to the Heddon Common quarries on Hexham Road, west of the village. Two wells are shown: Chare Well just east of the village pond shown as having a 'pump', and another on the west side of Station Road. Houses in the centre of the village both north and south of Towne Gate bear little resemblance to those there today although the road layout is little changed. Garden House appears to stand, as today, within its large plot of land to the south. Blue Row and Clayton Row on the east side of the village appear to form one long terrace, and the building to their south, on the east side of Station Road, is shown as the Post Office. A row of four cottages is shown at the head of Heddon Banks, presumably today's, 'The Cottage' and 'Carters Cottages' with an open yard shown to their east. The road appears to be gated here and there are no other buildings on Heddon Banks before the farm itself, shown with its circular gin-gang to the north of the barn and an isolated cottage to the east. There is a similar round building in the yard of Town Farm (unnamed and now Tulips haulage yard) on the north-east side of the village. The isolated house to the north of the road, opposite the farm, is in the same location as one today, 'Four Winds', with the present road now passing to its north. The later maps suggest that this building was part of Town Farm. The Glebe Lands around the Vicarage and between the Hexham Road and Military Road are marked as isolated parts of Castle Ward (within Tindale Ward). There was never a castle in the village. The second edition Ordnance Survey map was a revision of the first edition and was published in the late 1890s. The School House, just east of the school on Towne Gate replaced an earlier building. The plans dated c1893 are shown here. The building that housed the Post Office on the 1860 map has gone and the Post Office is now indicated at East Town House. Town Farm. Tank House and the Methodist Chapel are named, and the Church is again shown as dedicated to St Andrew. Town Farm's probable gin-gang has gone. The houses west of the Vicarage along Hexham Road much resemble their current form. On the south side of Towne Gate the Mens' Institute/Old Library is prominent, although unnamed. Mushroom Row is shown as five dwellings, east of the graveyard, with another terrace of three houses just south. Two parallel tracks or waggonways are shown terminating near buildings on Station Road south-east of the village; the one to the east, south of the road, is shown as 'Coal Depot'. Archaeological information records the finding of a Bronze Axehead in June 1893 near the Roman Wall. The third edition Ordnance Survey map, published in the early 1920s, was a further revision of the first edition. At this time, the Swan Inn, oposite the School, is named for the first time with a smithy shown as a detached building by its west side. The coal depot on Station Road bank is now shown as a large building by the most westerly of the two waggonway, south of the road. The Methodist Church now has a Sunday School on its south side, and the Post Office has moved again, this time to Jubilee Houses (unnamed) to its west. Rose Cottage and its outhouse stable building have now joined Ivy Cottage south of the Vicarage, on the west side of Towne Gate. The plans for the house and stable building to the west, dated 1907, can be seen here. The village Post Office would move another two times. In the 1960s it was part of Waugh's shop, the most westerly building on Hexham Road, next to the park. This is still known as 'Post House' but is now a private dwelling. Although the neighbouring houses to the east were built in 1829, this building is shown first on the 1897 map above. From the 1970s up to the present day, the Post Office was located in one of the modern shops in Taberna Close. 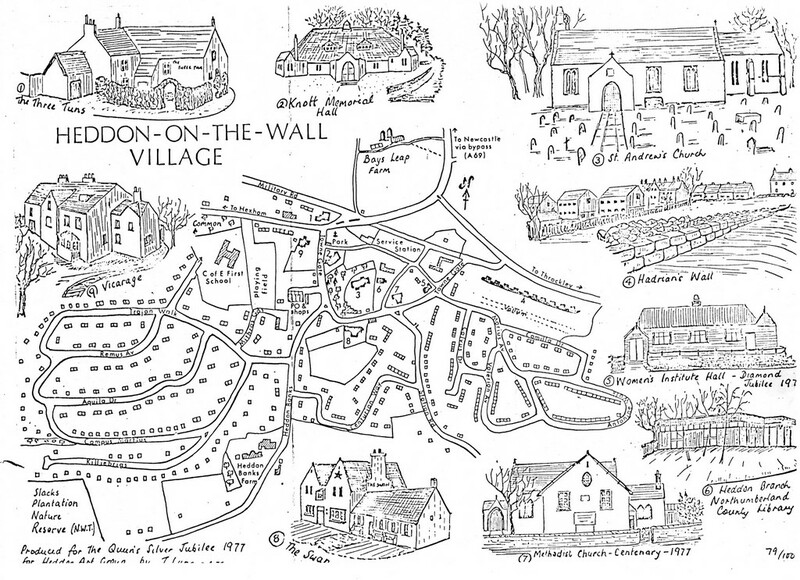 Illustrated map of Heddon on the Wall. Heddon Art Group (1977). The map was produced by the Heddon Art Group on the occasion of the Queen's Silver Jubilee in 1977. A limited number were hand coloured.